Rockstar Games also reminds you to pre-order your copy now and get a bonus $1,000,000 of in-game money to spend ($500K for Story Mode and $500K for GTA Online). And with IGN & Rockstar Games putting out quite a lot of information (and screenshots) last week we might as well cut through the jouralism garbage and present the big points that came out of it. Consider this a Reader's Digest of the previews. The big reveal last Tuesday was that GTA V and GTA Online will in fact have a full first-person feature. For this, Rockstar Games had to go beyond upgrading textures and draw distances for the new version of the game. They made objects much more detailed and had thousands of animations adjusted to look better while re-experiencing Los Santos and Blaine County. Vehicles now have detailed and functioning dashboards as well. Going further, helmets restrict your view and muffle sounds. If your character likes a song playing on the radio they can start bobbing their head - and your view - too. When Rockstar says they want you to become the characters they mean it. You may notice tons of details that have been there from the start including how pedestrians stare at you while walking by. You can turn off the view with the tap of a button and choose if you want to use it while in-cover or not. The next preview from IGN talked more about the visual details. 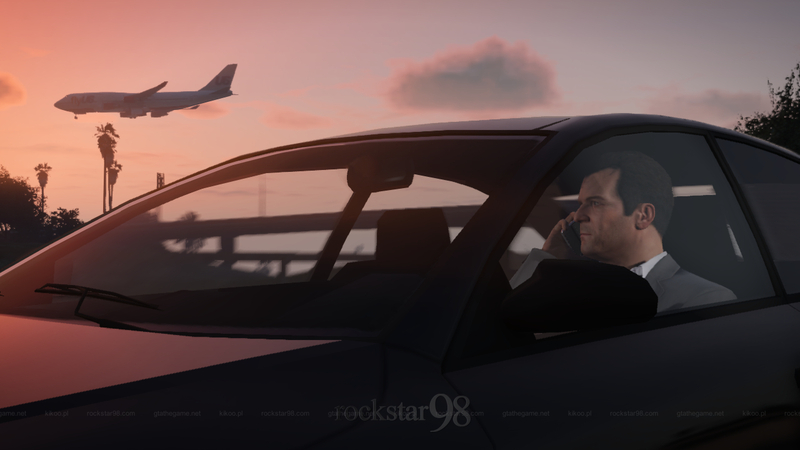 As revealed previously, all content updates for GTA V will be present in the new-gen version. Vehicles from the updates will appear on the streets as a part of the population. Vehicle and pedestrian populations have been increased to breathe more life into the game. But don't forget the vegetation. John Marston's jaw would drop from looking at the vast amount of plant life added to GTA V. Grass is no longer a flat texture over hills or open areas with some tall grass sprinkled here and there. Rockstar has added actual blades, flowers, leaves - and trash - everywhere. Another big point is lighting. Rockstar has completely upgraded the game's lighting from street lights to headlights. Light will refract through water including rain and even react to fog in a realistic manor so get those camera phones ready for awesome Snapmatics! Car reflections have received an overhaul as well with much more visible detail. Of course shadows also come into play with crisper lines or varying softness when needed and more realistic shadow casting between objects. The last part of IGN's preview covers GTA Online. As noted previously you can use the first-person view in GTA Online and hosts can even lock matches to use that view only if they wish (or allow a choice). The level of detail from storymode continues online to allow you to see enemies or targets further into the distance. New-gen GTA Online accomodates up to 30 players plus two spectators in a match. As was made known prior, you can transfer your GTA Online characters into the new-gen. You won't be stuck with the same old character, though. You will be allowed to adjust characterization stats and essentially reconstruct your avatar's DNA by adjusting almost every facial feature including nose and lips. This of course goes for newly created characters too. Finally IGN mentions that heists are still on the way for all platforms new and old but Rockstar gave them the broken record "soon" as a timeline. CVG also had a preview of the new-gen GTA V but pretty much said the same as IGN in fewer words. They reconfirmed the game runs at 1080p and 30fps with the PC version supporting 4K. They also metioned that there are 20 new species of animals and hundreds of new songs as well as hours of new DJ chatter. The PS4 controller will not only provide police radio but the light on the controller will also change colors depending on the character you are controlling. Grand Theft Auto V is definitely [re]shaping up into a great experience on new consoles and PC. Hit up the comments below with any other questions we might be able to answer. Check out 71 high-res screenshots in the gallery here and join the chat in the forums! Unknown, won't know until release, and I would assume yes. How much is the dukes? What are it's customization options? Last but not least can we keep it In our garages? GTA V Launch Trailer & New-Gen Info Roundup - A summary of last week's previews and information reveals for the new-gen GTA V.